There are books that we read that are so powerful they stay with us forever. For different people, they may certainly be different books—but there’s always something about the human character within those pages that becomes something almost like nostalgia. Often, they’re books you can read over and over again throughout your life. There are many authors out there—from the past and the present—I love. I hate to be asked what I’m reading most of the time or what books I would recommend because I read so many and have so many author friends I’m afraid I’m going to forget a wonderful author or great book. But for me, there’s one book I never hesitate to recommend, especially to author friends. 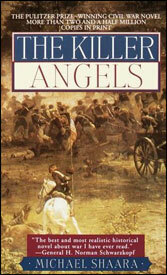 It’s a book about the American Civil War written by Michael Shaara and the title is Killer Angels. Now, I don’t recommend the book because it’s about the war. It takes place at Gettysburg—in fact, the movie made from the book is titled Gettysburg. And I think it was a good movie with fine acting by an excellent cast. But, a movie can’t possible give you what this book gives you because—although it takes place during an incredibly important time in our history; the turning point of the war, most scholars agree—it isn’t half as much about war as it is about people. I’m first generation American so I didn’t even have family here during the war, but reading this book, I cried for men on both sides. Shaara gives us men who fought together in Mexico, who went to school together, who were fathers and sons, in-laws, cousins and boyhood friends—and faced one another in a monumental divide. You come to know so many of the important players, where they came from, what they believed, and why they felt the passion they did for their causes. I’m going to paraphrase a bit, but through Shaara’s eyes, we come to tremendously admire generals Armistead of the Confederacy and Hancock of the Union; they were dear friends. Armistead was godfather to one of Hancock’s children. It is easy now for us to look back at slavery and wonder what those who came before us could possibly be thinking—it’s anathema to us to consider ownership of another human being. But we see the society that created that vein of thought, and from our lofty perches looking back, we can say they were pretty much so greedy capitalists. But, in a world where we still judge and dictate—as you can hear in the Broadway play Avenue Q we’re all a little prejudice, we’re fighting over gay marriage, abortion rights, etc., and women have really not had the vote all that long!—Shaara gives us a deeper insight into the lives that were led when our nation faced its mighty challenge for unity. We meet Lincoln and Lee, and see the heartache of Lee losing his wife’s family home, Arlington—built by George Washington’s stepson. We are able to see the courage of Mrs. Lee as well as the general—as she fled many times, she’d leave notes to the Union soldiers to please not destroy artifacts that had belonged to the Father of our country. I recommend this book as I said, especially to authors, because high concepts are great—but it’s always characters that make up a story be mystery, romance, suspense or in any genre of fiction. Michael Shaara won the Pulitzer Prize for fiction in 1975 with this title. He didn’t live to see the movie version but I think he would have liked it. Still, no matter how excellent the movie, it doesn’t compare, to me, with the pure written magic of the book. No one has ever made people come alive to me with such excellent characterizations put forth in this novel. For that reason—even if a reader loathes history!—I suggest that they read Killer Angels. Watch the movie, too, if you like—but Shaara’s words are true magic in creating scenes that the reader truly envisions and bringing to life men and women who lived at a pivotal and traumatic time in our history. ~ by Monette Michaels on September 12, 2012. I loved the movie Gettysburg so I need to check this book out!